For the past 12 years, supporters like you have been part of our annual charity golf tournament. You have helped us raise more than $300,000 in support of students. The money raised from this tournament goes directly towards student awards. By joining us for a fun day of golf, you are breaking down one of the most serious barriers that students face to completing their education – the financial demands of tuition and books. Because of you, more students are achieving their dreams and reaching their full potential. 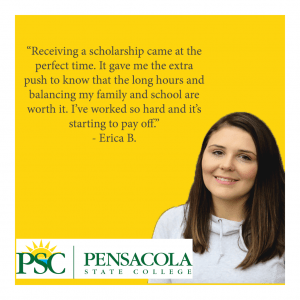 Thank you for making a difference in the lives of PSC students like Erica! For more on Erica, click the icon.